Start with a delicious breakfast inside the AAA Four Diamond Cliff House. The location was a hotel before Colorado was even named a state and the celebrity suites are named after famous guests who’ve walked the halls including past presidents and performers. Make your way to Old Colorado City’s Historic Center and learn how this district was the original territorial capital of Colorado. The expansion of the railroads and the discovery of gold in the Pikes Peak region put hundreds of small towns on the Colorado landscape. Most of these towns have vanished, but the Ghost Town Museum brings this period of history to life and gives you a glimpse into the late 1800s with a general store, blacksmith, hotel, jail and residence from the Pikes Peak or Bust gold rush days. Test your marksmanship at the laser shooting gallery and have fun picking out souvenirs in the large gift shop. Head over to the Gold Room that is housed in the former Colorado Springs Utilities building. True to the building’s classic 1933 design, the 6,500-square-foot venue has been retrofitted with a stage and a 270-degree mezzanine balcony with gold railings repurposed from nearby window ledges. The Gold Room features a variety of entertainment each week, from comedy to live music. Afterwards, visit the adjacent Mining Exchange – A Wyndham Grand Hotel for drinks in the lavishly appointed lobby or to stay the night in rooms that blend modern amenities with historic charm. To understand the rich and diverse history of Colorado Springs and the Pikes Peak region, start your day at the Colorado Springs Pioneers Museum in downtown Colorado Springs. Admission is free, though donations are very welcome. The museum is housed in the beautifully restored El Paso County Courthouse, also rumored to be haunted by the former custodian. After lunch at one of the excellent restaurants on Tejon Street in downtown Colorado Springs, head over to the Spencer Penrose Heritage Museum located on the grounds of The Broadmoor. 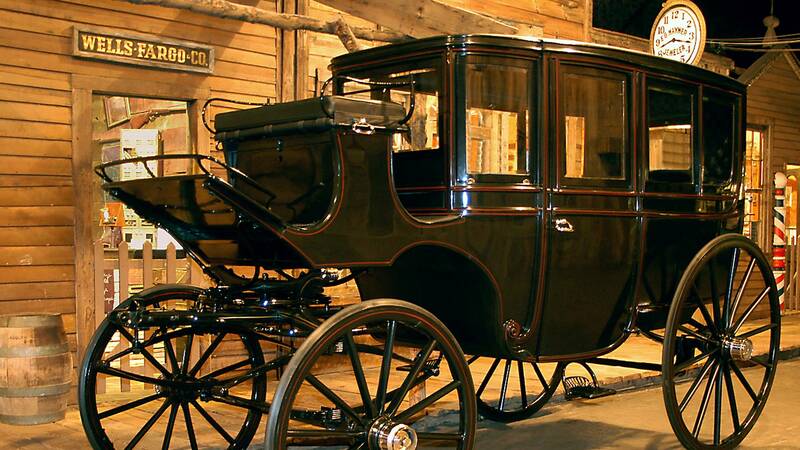 The museum’s collection contains 31 horse-drawn carriages,13 motorized vehicles and two presidential carriages, including an 1841 Williamsburg Brougham used for the inauguration ceremony of President William Henry Harrison. The museum is open to the public daily and free of charge. The Pikes Peak Hill Climb Experience simulates the numerous switchbacks of the Pikes Peak Highway, offering visitors a feel for the 12.42 mile track winding to the summit of the 14,115-foot mountain. The Rock Ledge Ranch Historic Site is an educational, non-profit living history farm and museum that depicts life in the Pikes Peak region in four time periods: American Indian area in 1775; 1860s Galloway Homestead; 1880s Chambers Home and Ranch; 1907 Edwardian Country Estate. Knowledgeable, costumed interpreters will assist you on your journey through one of the nation’s premier historic sites. Located adjacent to Garden of the Gods Park. Enter the grounds of Glen Eyrie Castle, built by Colorado Springs town founder General William Jackson Palmer. Now owned by The Navigators, the castle is open for tours, special events and afternoon teas. Learn the history of this beautiful location and make sure to keep an eye out for the big horn sheep herd that call the place home. Western rodeo comes alive at the Pro Rodeo Hall of Fame & Museum of the American Cowboy. Permanent and rotating exhibits feature western-themed artwork as well as memorabilia from the country’s greatest professional rodeo cowboys and performers. Hall of Championsis the main hall where cowboys in each rodeo event are honored. In addition, stock contractors, clowns, announcers, rodeo committees, rodeo stock and other notables of the sport are honored. Visit National Historic Landmarks in the region.